Type “chrome://flags” in the address bar, then press “Enter“. Find the setting called “Overlay Scrollbars” and set it to “Disabled“. Restart Chrome, and test out the webpage. Hopefully, you will be able to scroll now. Turn the system back on. When you hear the Apple startup sound, quickly press and hold the “Option” + “Command” + “P” + “R” keys simultaneously. When you hear the second Apple sound, release the buttons. You have reset the NVRAM or “zapped” the PRAM. Give Chrome a try now. Select Apple Menu > “System Preferences...”. 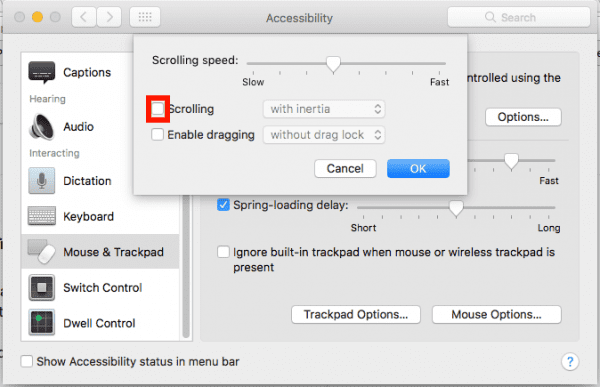 Choose “Mouse & Trackpad” in the left pane. Select the “Trackpad Options…” button. Give Chrome a try now. Able to find scroll bar in few pages but not in few other pages. it didnt work me.. any more suggestion? Thanks for that, saved me and the wife from throwing our Chromebooks out of the window!